The Absarokee Loop Scenic Drive is a forty-four mile long route that makes a scenic loop through a scenic and quiet corner of Montana. 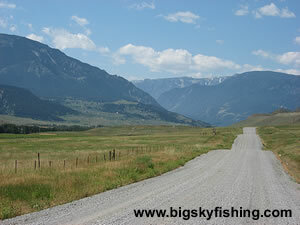 The route, which follows a series of paved and gravel roads, provides excellent views of the Beartooth Mountains. 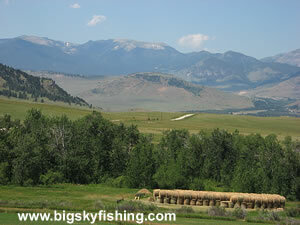 Highlights of the trip include the Stillwater River, beautiful valleys and excellent views of the Beartooth Mountains. Beginning in Absarokee, the route heads west on Highway 420, which parallels the Stillwater River. For the first seven miles the road is paved, but as the route approaches the foothills of the Beartooth Mountains, the surface changes over to an all-season gravel surface. Initially, the Absarokee Loop Scenic Drive passes through grasslands and agricultural fields. However, after ten miles the route reaches the Cliff Swallow Fishing Access Site, passes through a small burn area and then enters the “canyon stretch” of the drive. For the next ten miles beyond Cliff Swallow Fishing Access Site, the Absarokee Loop Scenic Drive starts a beautiful journey as it meanders its way through a narrow valley surrounded by the tall and steeply rising foothills of the Beartooth Mountains. The road closely follows the Stillwater River, and several designated fishing access sites are located along this part of the drive. Although the drive passes through a narrow canyon, the towering peaks of the Beartooth Mountains to the south provide a beautiful backdrop. After nineteen miles, Highway 420 ends at the junction with Highway 419 in the town of Nye. The Absarokee Loop Scenic Drive heads to the east, following Highway 419, which is a paved road. Outside of Nye, the route meanders along the base of the Beartooth Mountains, providing spectacular views of not just the mountains themselves, but also the foothills and scenic valleys that lie at the base of the Beartooth Mountains. As the scenic drive continues heading toward Absarokee, the route veers away from the base of the Beartooth Mountains and starts following Fishtail Creek as it flows through the foothills of the Beartooth Mountains. As the route nears Fishtail, Montana, the drive leaves the foothills behind and enters the grassland prairie, which allows for superb views of the Beartooth Mountains to the south. Several miles beyond Fishtail, Highway 419 ends at the junction with Highway 78. The Absarokee Loop Scenic Drive follows Highway 78 for three miles to the town of Absarokee and completing the scenic loop. Overall, the Absarokee Loop Scenic Drive provides visitors with superb views of the Beartooth Mountains and the scenic foothills and valleys that lie at the mountains base. Additionally, the Stillwater River provides excellent trout fishing in an area that has very light fishing pressure. The map below shows the route and location of the Absarokee Loop Scenic Drive in Montana, along with other nearby scenic routes. The tiny town of Nye basically has no services, although I think there is bar/restaurant in town that probably sells some limited supplies. That said, I'm not 100% positive about that nor am I sure of the hours. There are several developed campgrounds along the route, all of which are located on the Stillwater River. Additionally, many side roads lead off toward the National Forest, which allow for primitive camping. The nearest lodging options to the route are found in Columbus.